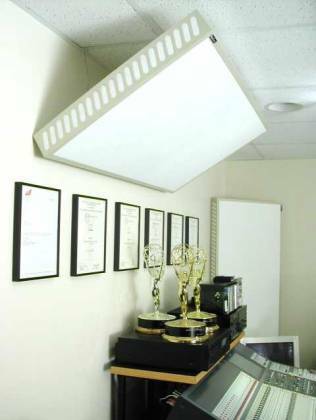 It is difficult to review RealTraps acoustic treatment panels. Unlike front-end equipment, you can't play with them for a month and simply send them back; acoustic treatment panels must be installed. The reviewer must be interested enough in acoustic treatment to install them, and yet not have any treatment already. For EnjoyTheMusic.com, this neophyte, cheapskate reviewer fit the bill. First, I leaned the square white MiniTraps acoustic panels ($179.99) on the floor and loved their affect on music; then I bought and installed half dozen of them in the ceiling and two front corners. RealTraps is owned and operated by musicians Ethan Winer and Doug Ferrara. Their operation is near Danbury, Connecticut; New York City is about an hour away. The business is the extension of their tweaking audiophile efforts. Ethan became annoyed with foam rubber "acoustic treatment" and outrageous prices - especially since these materials are ineffective at very low frequencies. "I've never seen or tried the room lenses," Ethan said via email, "but I can't for the life of me imagine how they could do anything useful. First, they don't cover enough surface area to interact with the long wavelengths of low frequencies. Second, they claim to be tuned Helmholtz resonators. Tuned to which frequencies? The specific needs of your particular room? Unlikely. Tuned treatment is very old school anyway because it ignores the fact that all rooms have severe peaks and dips at all low frequencies, not just those related to the room dimensions. That, coupled with their cables, er, interconnects, selling for more than $200 per foot, makes my BS meter light up pretty brightly." His MiniTraps are larger, thicker and denser than I imagined. There is nothing "mini" about them. The panels are two by four' white panels, over 3" thick, packed with rigid fiberglass and banded by a thin metal box. The thin eggshell-white frame around the panels is open with slots. The slots on the sides allow sound to enter the absorbing material. The panels weigh a light, but awkward, 16 pounds. The panels are covered in a linen-like fabric, black or white. They are non-flammable and easily hung on walls like large pictures. Although more effective, corner placement is quite a bit trickier. Ethan says MiniTraps offer more absorption per dollar at low frequencies than any other product! One reason they are superior to simple foam is because rigid fiberglass is dense. Typical acoustic foam is less than 2 pounds per cubic foot of density. MiniTraps are 6 pounds per cubic foot. At 100Hz, the panels absorb nearly three times more than corner foam. They also offer thinner MicroTraps, only 1.35-inchs thick. The MicroTraps cost less, but do not absorb low frequencies as well. The MicroTraps are useful for large rooms that have large areas of bare wall. Where MiniTraps are useful for home theaters, MicroTraps make sense for recording studio applications. MiniTraps are the duo's most popular model, selling six to one over the smaller MicroTraps. The white color predominates over the black by two to one. There is no break-in period. Two page instructions, with ten graphics, are included with each box. There is no internal bracing inside the white panels, only three thin crossbars on the rear, with a dozen small folded tabs punched up to hold wire. "Very soon," Ethan said, "we'll be switching to a new style of case that's more rugged...less likely to be damaged in transit by the UPS gorillas." Everyone who saw my panels thought they were new loudspeakers or a flat panel TV. They look like Magnapan speakers. I hung small pictures on the wall panels merely by pushing a finishing nail into them. Ethan wasn't sure about this. "I have no idea because I never measured how attaching a picture affects absorption," he said. "My gut feeling is it's not a great idea. A paper poster would be okay because bass frequencies will go right through it. You could paint on them, especially with water colors." If someone really wants to, you can wrap them with fabric, or even spray paint them. Generally speaking, most rooms need as many bass traps as you can fit and afford. Although more is better with the square panels, it is possible to have too many. "For most rooms eight is about ideal," he said. It is probably not possible to have too much low frequency absorption, though you can make a room too dead with too much mid/high frequency absorption." 1. Get enough of them. 2. Put them all in corners. Eight MiniTraps is sufficient to balance the acoustics at all frequencies in most "normal size" rooms in a home, if the traps are installed across the floor and ceiling corners. This is because of the large triangle opening behind the MiniTrap when it is mounted across a corner. Many mid/high waves are absorbed that way. At the minimum, he recommends placing bass traps in all of the corners. For even better results, put additional traps in the ceiling corners as well as the regular wall-to-wall corners. Most rooms need at least four MiniTraps to make a meaningful improvement in the low-end frequency response. "For example, my living room is 16 feet by 25 feet with a peaked ceiling that reaches 11 feet," he said. "I have nine MiniTraps mounted permanently in the various corners and that does a fine job... if I had 13 panels of fiberglass or foam the same size I'm sure the room would be too dead, and the bass would still be out of control." At first, before I installed some of them, the panels leaned against the side walls, near the loudspeakers. Even so, their affect on music was noticeable. My initial reaction was to turn off the lights, take a match to a small candle and contemplate the magic of the right music and system at creating a nether world of audio nirvana in the flickering shadows. With Dido and Norah Jones, my initial impression was the panels were not immediately overwhelming - not like plugging in a sub-woofer say, but defined vocals better. There was less echo-like harshness (a particular liability of big ole horns). Sound was obviously smoother, with better upper bass tone. Even leaning casually against the floor corners, the panels added that elusive quality of background darkness that only high quality and expensive amplifiers add to the music. They softened the glare of the big old horns without removing the blat and the blare of saxophone and trumpet. They helped with the Nth degree of realism that suspends disbelief and makes the sonic 3D illusion possible. The white squares seem to even and smooth out guitars, for example, while preserving the knock and snap of drums and bongos on Patricia Barber's Modern Cool. Ohh, the elixir of music! Maybe it was because of the first cool nights in southern Florida, maybe because the power lines are clean with air conditioners silent, maybe because the windows are open and a brisk breeze dances the curtains; whatever the reasons, the overall first impressions of these big white squares are wonderful. Down the hall, little miss sensitive ears admits, "it sounds pretty good actually"; tantamount to a hearty endorsement from the reluctant same. The big white squares make the harshness of decades-old recordings - Fleetwood Mac's sizzling high-end on the 1979 "Tusk" specifically - not just tolerable, but enjoyable. Little miss sensitive ears even liked an older Linda Ronstadt recording that used to annoy her. After a raucous Traffic session, she said "sounds good, doesn't it?" Yes dear, it does. The big white squares are a more important improvement to my modest system than the addition of Coincident Technologies' thick, gray CST 1 rattlesnake cables. I loved the clarity they brought to each song. Uncrowded instruments made sonic effects stand out, rendering Norah Jones as dramatic as A Decade of Diana Krall. All this by the way, was with just six traps: one on the front wall, two on the sides and only one on the rear - all at floor level. RealTraps brought my flea-powered tube Bottlehead 2A3 Paramour amplifiers closer to the "Pass Laboratories Supersymmetry Balanced Single-Ended Class-A X250" amplifier's excellence. Combined together, the panels improved separation between instruments: cymbals simmered a microsecond longer. The panels helped me listen into the music. Removing one by one was not so noticeable�until they were all gone. Then the nasties that spoil big ole horn's good name returned. Once installed, the big white squares made my stereo the apple of my eye again: they brought delicious back to the golden level. Like any elixir that breathes new life into tired bones, the RealTraps prompted ambitious journeys�through the disc rack. Forgotten favorites were found again; new ones rediscovered. "Coming out of country," K.D. Lang's incredible voice was more focused, cymbals better balanced with the bass. Whatever acoustic placement is ideal for the big white squares doesn't really matter in the practical scheme of things. Integrating their ungainly presence visually into the listening room becomes paramount. You put them where they look best, not where they stick out and work best. Corner installation above my big ole horns made the biggest sonic and visual impact. The panels require lots of anchor bolts and picture wire, wire cutters, a level, a second pair of hands and a ladder. For wall mounting, try putting the wire on lower set of hooks, so the lose wire doesn't show. It took about an hour for each one, including winding the picture wire on the back. Expect some pencil-thin scratches on the paint when placing the panels in corners. For corner mounts, try putting the bottoms in first, then swing the tops up and secure them. Upward firing lights will illuminate the back of the panels, so you can see the wire mounts. Do aim to get them all into corners one way or another. All else being equal, ceiling corners should be about the same as floor corners. It's more important to spread them around the room than to put them in specific corners. I was skeptical at first and read carefully over RealTraps' useful website. Lots of good practical information there. Little of the obscure smoke blown at some high-end A/V salons. Actual measurements and graphs. Helps to read before buying of course, but equally informative afterwards too. The panels come two in a door-seize box. Order more than you might actually need and play with less and more of them. You can always send them back (but you won't). Before buying, skeptics can hear the effect of MiniTraps at home by playing low frequency sine wave tones from a Test CD. They should walk around the room listening for places where the bass notes drop out or are excessively loud. Although inaccurate, the simple clap test reveals echoes in the room. With MiniTrap padding, these will be almost gone. My clap test? Conducted in a square only a few paces per side, this inexact measure showed less of the annoying resonance that shadows your smacking hands like a pesky bill collector. If you prefer to avoid permanently mounting the panels, you can put them vertically on cardboard boxes in the regular corners, and lean the others sideways against the wall bottoms at 45 degrees. A corner at the bottom of a wall is just as valid as at the top. A cardboard box does impede wave flow into the bottom of a corner-mounted MiniTrap, so it may have no advantage to just putting them on the floor. On a cheap tweak scale (see "Cheap Tweaks That Sound Like A MILLION BUCKS!!!") from one to ten, upgrading to Home Depot hospital grade electrical outlets rates a solid one, possibly two. A posse of MiniTraps rate much higher: somewhere near four or six, almost up there with recommended loudspeakers and amplifiers. "You have not ever heard what your basic components or recordings sound like until you've heard them in a proper, acoustically tuned room, Ethan says. When you do, you'll realize how worthless most so-called 'tweaks' are." For cleaning, Ethan advises, "the fabric fronts can be cleaned of lint, dog hair and debris with Scotch tape or shipping tape. Just push the sticky side of the tape onto the fabric and lift. You can clean soil off them with a little glass cleaner sprayed onto a paper towel. Then rub the towel gently on the fabric. Glass cleaner will also clean the painted metal." RealTraps includes thin and stocky protective foam blocks at each end of the large shipping boxes. Use the blocks as spacers to increase the air behind the wall-mounted panels. Clips for false ceilings are also available upon request. Email support was polite, informative and immediate. RealTraps also supplies the raw fiberglass. Owens Corning Type fiberglass boards absorb down to 250Hz. They have no formal showroom, but Ethan shows off his own panel-lined studio by appointment. Each significant improvement to my home movie and music reproduction systems feels as if the system has reached a high Sierra plateau, where no mighty blast of inexpensive air could fill its wings and lift it higher. Tube amplifiers, dual subs, Coincident rattlesnakes and now, real MiniTraps acoustic panels, who knew I could find such a mighty gush of inexpensive air at a plateau this high? No matter how high a plain upon which your home movie and music reproduction system rests, I am certain the fresh air of MiniTraps can lift any modest or superb A/V system to a new plateau. Strongly recommended for tweaking audiophiles. Looking for that next step towards tonal truth? Progress ye towards a flatter, more accurate frequency response. Get out your picture hanging tools. Dampen ye walls! I now think room treatments are an integral part of any home movie and music reproduction system. I encourage all tweaking audiophiles to consider RealTrap acoustic treatment panels for their systems.